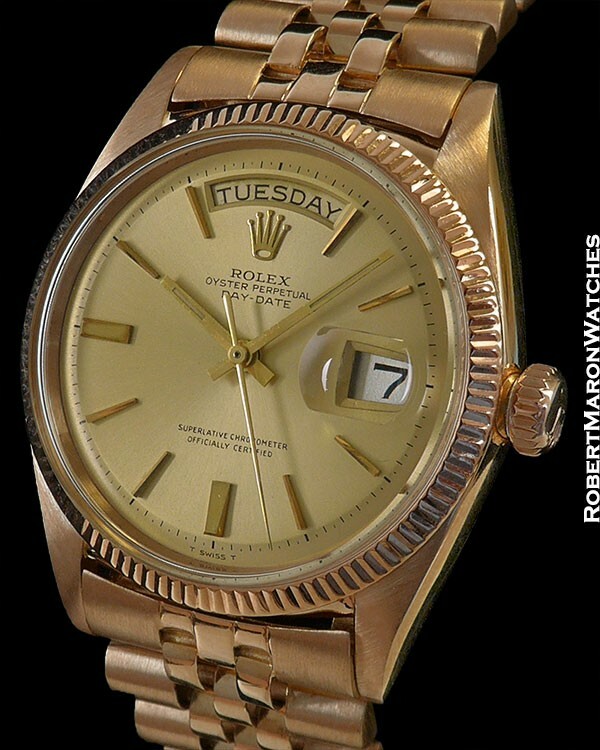 Rolex introduced the reference 6511 Day Date in 1956, which was replaced within one year by this reference 6611. The 6611 has several important and interesting characteristics: first, its movement made great improvements over its predecessor by changing how the day display advanced. Whereas the 6511 would store up energy for only a few minutes before midnight, the effect of which was that timekeeping for half an hour or so prior to the day change over was very poor. The movement in the 6611s stores up energy for the day advancement continuously, resulting in less rate disruption and better timekeeping. Further, its movement had a free-sprung balance with microstella fine adjustment and the 6611 is the first Rolex with “SUPERLATIVE CHRONOMETER OFFICIALLY CERTIFIED” on its dial. Very rare original 18k rose gold case has the 6611’s distinctive fluted bezel, which has a different pattern from the more familiar fluted bezels used on the later Datejusts and reference 1803 Day Dates. Screw down crown is working perfectly. Plastic crystal. Screw down case back. This case still has the bubble look to it, versus the later and sleaker 1803 cases. Dimensions are 35.5mm diameter by 12mm thick. Champagne radially brush finished pie-pan dial with applied golden hour markers and golden baton hands. Being a Day Date, the entire day is displayed at 12 o’clock. Original automatic winding Rolex Caliber 1555 with 26 jewels and adjusted to five positions and temperature. Movement is a C.O.S.C. Certified Chronometer and is clean and running. 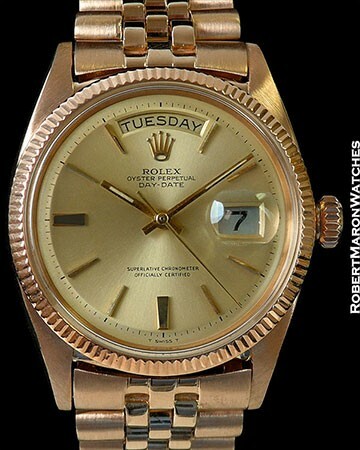 Rolex 18k rose gold Jubilee bracelet, in an of itself extremely rare, with 1966 date code and light stretch. Watch is in mint/mint+ condition.